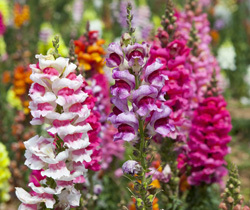 We stock a large selection of herbaceous perennials to complement your outdoor landscapes. Add that extra splash with blooming annuals, whether pansies or petunias, mums or marigolds depending on the season. Vegetable Plants: When in season, we offer the following: Cold crops (frost tolerant): broccoli, cauliflower, cabbage, lettuce, bok choy, Brussels sprouts, collard greens, mustard greens, Swiss chard, and spinach. 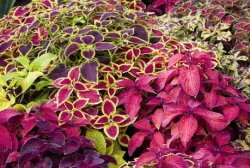 These are usually available by the end of February and again for a fall garden around September. Warm season veggies: We carry a large selection of tomatoes, both heirloom and hybrids. Also available are peppers (sweet and hot), eggplant, squash, okra, cucumbers, watermelon, and cantaloupe. These are usually available by the middle of April. We advise gardeners in this area to cover or otherwise protect these tender plants if frost advisories are out. Danger of frost is usually over by the last week of April in Asheville, by the middle of May in the higher mountain valleys.